The Allies go on the offensive against the Dominion. Captain Sisko must make a choice that puts one of his friends in danger, though. I wish I hadn't done it with Mirror Jadzia. 'Cause now this is just weird. Matthew: There's a lot going on in this episode, probably best described as a three-part plot. The A story is the invasion of Cardassia. All in all I think this part is handled pretty well. The basic political wrangling, while nothing new, is ably accomplished. Reintroducing Dukat into the situation gives us some fun scenes with Damar and Weyoun, which lets them play off of each other nicely (though I wonder why Dukat was let into the inner sanctum more than once, but whatever). I will say that I thought there was too much of Damar and Weyoun looking at a static screen in a room alone while the attack went on. I get that this is a budget issue, but it detracts from the story and it would have been nice if they had written in some sort of workaround. The only thing I really think is a failure is the "regenerating weapons platform" idea. They are dramatically inert, not to mention a repeated idea. Kevin: I agree that the political and war stuff worked overall. Everyone's positions made sense. The Klingons always want to attack, the Romulans prefer a more calculated approach, and the Federation falls somewhere in the middle. The wrangling was fun to watch as well. I agree that Dukat pretty much should have been arrested on sight, and I'll get to my problems with the pah-wraith stuff in a minute. but hey, I'm never going to tell Damar, Weyoun, and Dukat to not have a conversation in my presence. I think the weapons platforms could have been made slightly more interesting if they had tossed in a throw away line that the underlying technology was derived from the Federation's mine field. It would have been one of those "big picture" touches that Star Trek can do well when it comes to war. Matthew: The Dax story was a failure. The lead-ins were arbitrary and maudlin. They really oversold the "yay, we're going to have a baby" angle, the "I prayed for you" angle, everything. I did not enjoy Quark and Bashir mooning over her, yet again. This line of storytelling has been asked and answered already, and it's rather trite and sexist, if you ask me. It seemed like an excuse to wangle another Vic Fontaine scene, which did not really add to the proceedings. Then, why is Dax even staying on the station, except to be killed? She has gone on virtually every other combat mission in the series. Her death was pointless. The only aspect of it that I enjoyed was Dukat's "nothing personal" line. Kevin: I remember being as annoyed by this death as I was by Tasha Yar's. It's so senseless. It's even more senseless than Yar's insofar as the episode was trying to use it to establish the arbitrary and cruel nature of the villain. This was just arbitrary and stupid. If you wanted to off her, at least give her a hero's death, or just reassign her or something. Also, as a feminist, I find it lazy writing to focus on her having a baby as a means to up the stakes of her death. I liked the Dax character and her loss is sufficient per se to make me feel bad. Matthew: The third leg of the story is Sisko as Emissary disobeying (I guess) the Prophets. You know, if the Prophets are going to exact retribution for disobedience, they ought to be a hell of a lot more specific about their desires and the consequences. What does Dax have to do with anything in terms of Prophet retribution, anyway - or was this just a prophecy? 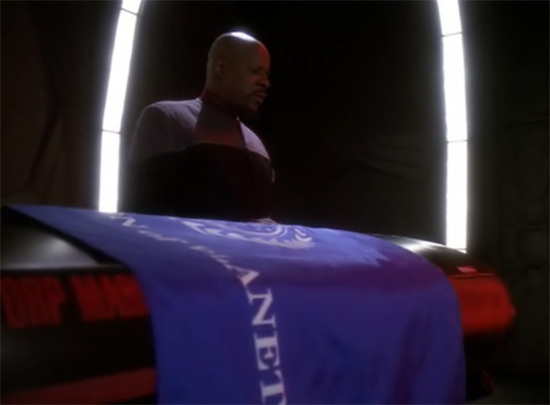 How is Sisko's absence in any way connected to an otherwise random occurrence? If Dax had gone on the mission, would someone else have bought it? All that said, I like the concluding note, of Sisko returning home to Earth after screwing up so royally. It finally puts some dramatic teeth to the recurring story thread of Sisko's conflicting roles - and any time we get to see Earth, I'm into it. Kevin: Yeah, any time their dire warnings rear their heads, I get some combination of confused and bored. Maybe they could have repaired it by tying it to their last vague warning from Sacrifice of Angels. 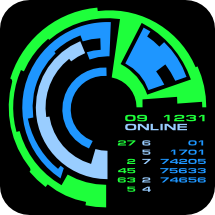 If stopping the Dominion then somehow set this specifically in motion and the Prophets knew that, maybe that could have felt more coherent, but it's still hard to see it as a viable option to let the Dominion fleet through. As we've said before and will say again, you can't make the vague, extra-linear dealings of the Prophets a centerpiece of the action without really having the endgame clearly planned out. Matthew: Other random notes wedged in to this crammed story were Jake wanting to tag along for journalism, which was fine. The Kira/Odo stuff was utterly superfluous, and led to the really oogy scene of Kira kneeling in front of Odo's security chair and leaning in for a... kiss (whew). Kevin: I was annoyed that their "fight" felt very sitcom-y. I actually would have liked a real exploration that Odo on some basic level does not understand how humanoid relationships function. He lacks both the instincts and experience to navigate the dozens of small interactions that your average humanoid could handle without being aware they had done so. That could have really elevated the whole plot. Matthew: In my reading on this episode, Terry Farrell seems to be saying she had a hard time holding it together during several scenes. I think it showed, and that this added to the maudlin feeling that the proceedings took on. Dorn did a good job staying in character, though. I could basically have dispensed with Siddig and Shimerman - not that they did anything bad, but they did not elevate mediocre character material. Kevin: I saw an interview with her where she said she was asked when she wanted to do her death scene first thing or last thing, and she chose last because she knew if she had to do that scene essentially by herself for the close-ups then leave to an empty parking lot at 11pm, she would lose it. She also mentioned she kept botching the take when Worf screamed because she couldn't stop crying. I found it interesting because whatever her reasons, I think it shows she didn't arrive at her decision lightly. I agree that doing her death scene first cast a kind of pall. The episode becomes a were inverse epilogue for her. Matthew: Marc Alaimo, Casey Biggs, and Jeffrey Combs were beyond reproach, yet again. I noticed a lot of little things with Biggs this time around, little half concealed sneers, some creeping doubt, it was really good work all told. Alaimo, too, did a great job of hinting at the crazy without being too obvious. Matthew: Avery Brooks did a good job modulating himself - not going too hammy in some scenes that might have threatened it - especially his boardroom and funeral scenes. He's come a long way from "it is not linear." Kevin: The way he portrayed feeling lost without Dax was really affecting, and his description of his relationship with the two hosts was very moving. There's something intriguing about having essentially two different kinds of relationship with the same person, and because they focused on the emotional impact of that, a neato sci-fi concept was well explored, and I probably came closer to crying then than during her scene in the infirmary. Matthew: The CGI was effective, but not seamless. Some aspects were pretty obvious, but it all moved quite quickly, so it wasn't jarring. Whatever the flaws, the action was directed well. There were a lot of neat ship close-ups, and it was always possible to tell what was happening. I will say that some of the ships moved too much like they were in an atmosphere with gravity, but that has rarely been done well by anyone, anywhere. Kevin: I liked that even in SD, you could make out ship names, like Valley Forge on the Excelsior class ship. There was an element of watching some WWII documentary or movie, and I mean that as a compliment. It had a scope that was quite impressive, and despite the sheer number of elements, the screen never felt crowded or the narrative muddled as a result. I would have liked at least a shot of the ground troops landing. Matthew: I didn't like Damar's command center. It was too empty and the graphics were bland. The Cardassian matte is such a waste of interesting public space - even a few animated Cardassians would have helped. The optical effects with the Prophet/Pah-Wraith stuff were nothing special. The wormhole closing was similarly adequate. Kevin: I always want more people buzzing around the command bunker on Cardassia. Even without a war, it's the hub of an intergalactic empire. People should always be busy. Matthew: Wow, what a mixed bag. On the plus side, I definitely want to see the next episode. Sisko's journey is interesting, and I want to see the whole "boots on the ground" aspect of Cardassia. On the other hand, the Dax storyline was pretty bad, and all of the little character filler bits were grating. So I can only go with a 3. Kevin: I agree with the 3 for a total of 6. The war arc was fun and well executed and everyone turned in to good to very good performances. The Dax plot felt stitched on and the seams were definitely showing. A better send off for such an interesting character would have really elevated this one. Why did they kill off Dax so late into the show? This was the sixth season. I read an interview with Farrell saying her contract was just not extended so she left. At the same time I have read on MA that she left to join the cast of Becker (from which she was let go eventually - ha!). That was a really stupid decision to kill of Jadzia. I like Esri just fine, but to kill off a major character so late in the show just seems like a bad idea. The podcast for Valiant is now online!